Red Sleeping Beauty formed in Stockholm in 1989 by singer Kristina Borg, singer/guitarist Niklas Angergård (Acid House Kings), guitarist Mikael Matsson (Shermans), and bassist Carl-Johan Näsström. 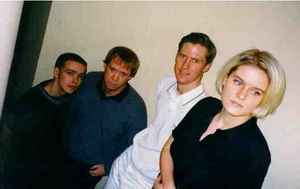 They made a huge impact on the international indiepop scene with two fantastic albums and a series of singles and EPs. Their first release was in 1992 with EP Pop Sounds (Marsh Marigold), followed by four 7"s all on different pop labels (Somersault, Motorway, Grimsey, and Sunday) before returning to Marsh-Marigold for the first full length Bedroom. They then signed to the legendary Siesta Records to release their fifth single Sick & Tired, their second album Soundtrack, and a compilation of singles. In 2014, the band reunited in the studio to record "Just For Fun," an Alpaca Sports cover, as well as "Merry Christmas, Marie" as a special holiday track. Now in 2015, Red Sleeping Beauty will release a brand new single "Always" b/w "Breaking Up Is Easy".